Lac-Megantic, Quebec (dpa) – Maude Verreault says she will never forget the screeching noise she heard on the night a runaway train laden with 72 cars of crude oil barreled toward her. It was a busy night at MusiCafe bar, where she worked as a waitress. About 50 people had gathered at the bar to enjoy a beautiful summer night as she got out on the terrace for a short smoke break. “I heard an incredibly loud noise, I turned my head, and I saw the train coming at an incredible speed,” Verreault said. On that terrible night, 47 of her townsfolk died – some incinerated – as the train derailed and exploded in the middle of Lac-Megantic, about 250 kilometres east of Montreal. In the picturesque town of 6,000 near the border with the US state of Maine, residents were gathering this weekend to observe Sunday’s anniversary of the July 6 disaster. Many still can’t believe how innocent they were to the dangers presented by the tanker trains that grew in length with each passing year. From the porch of their hillside house on Laval Street, Gilles Orichefski and his wife, Jacqueline Roy, can see what remains of Lac-Megantic’s central district after the disaster. They said they always knew that the oil-laden trains chugging along the rail track behind their house were a disaster waiting to happen. “The rail company started with five or six tanker cars, and before we knew it, they were running entire trains with dozens of cars filled with oil,” said Orichefski, 80. Railways in the United States have seen similar spikes in oil transportation, driven by dramatic growth in shale oil production and limited pipeline capacity. Statistics released by the Association of American Railroads show that in 2013 US railroads moved 407,761 carloads of oil, up from 9,500 in 2008. 2014 promises to be another bumper year. Just in the first quarter, US railroads moved a record 110,164 carloads of crude. Much of the recent increase in US oil drilling has been in North Dakota, where crude oil production rose from an average of 81,000 barrels per day in 2003 to nearly 1 million barrels per day by early 2014, making it the second largest oil producing state after Texas. The North Dakota Pipeline Authority says almost 60 per cent of the state’s oil production is shipped by rail. The tanker cars that devastated Lac-Megantic were laden with the more flammable crude from North Dakota’s Bakken oil field. As construction crews in Lac-Megantic continue to decontaminate soil in the burnt out shell of the downtown, a growing chorus of voices is calling on governments in Canada and the United States to introduce tougher safety regulation for transporting oil and other dangerous goods. 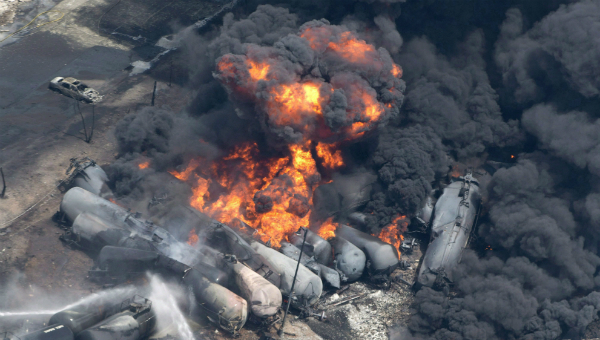 Investigators with Canada’s Transportation Safety Board investigating the Lac-Megantic disaster have come out with a series of urgent recommendations to Transport Canada, the federal agency overseeing railways. They include phasing out the older DOT-111 tanker cars, the kind of tankers that punctured and exploded in Lac-Megantic. Roxane Marchand, a spokesperson for Transport Canada, said Ottawa wants to phase out these older tankers within three years. Railway Association of Canada president Michael Bourque said 50,000 newer and more robust tanker cars are on order, and another 30,000 are already in service. According to TSB statistics, there are still about 228,000 older DOT-111 tanker cars in service in North America. Another key safety recommendation is to require emergency response assistance plans for even a single tank car carrying crude oil, gasoline, diesel, aviation fuel or ethanol, Marchand said. Further, Ottawa wants rail companies to slow down trains carrying dangerous goods. Similar measures have been introduced in the United States. But those reforms ring hollow to many Lac-Megantic residents, who want the government to build a railway bypass around the town.